Duke coach David Cutcliffe said some things most coaches avoid at a spring game. He raised expectations. Midway through the Spring Showcase Saturday at Wallace Wade Stadium, he had his players take a knee at midfield. He took a microphone and introduced the Blue Devils’ most improved offensive and defensive players. Then, before the live scrimmage began, he volunteered how excited he was with the team’s progress, talent and depth. The Blue Devils’ 11th-year head coach is from Alabama, but he’s definitely not from the Nick Saban School-of- Sparing -Praise. Duke returns 16 starters and 47 lettermen from a team that won its final three games, including the Quick Lane Bowl over Northern Illinois, to finish with a 7-6 record. One reason for the optimism – in the eyes of the coaches and players – is backups stood out as much as the returning starters. 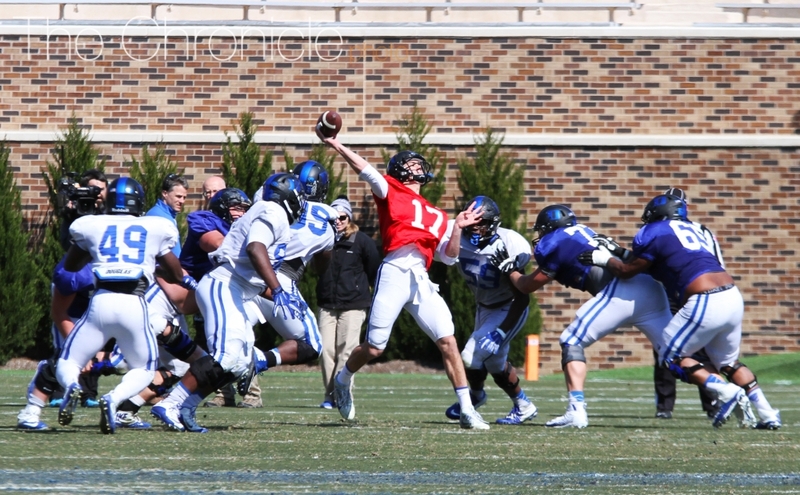 Redshirt junior quarterback Daniel Jones leads the returning starters. He threw two touchdown passes in the 50-play scrimmage. He was eight-of-15 for 83 yards with touchdown passes of 11 yards to backup sophomore tight end Noah Gray and eight yards to senior wideout T.J. Rahming. Gray adds to a tight end corps that was already deep with the return of juniors Daniel Helm and Davis Koppenheimer, who combined for 39 catches and five touchdowns. That opens up possibilities on offense for Jones to keep the defense guessing. That led Cutcliffe and Jones to mention sophomore running back Deon Jackson, one of the two most improved offensive players along with sophomore right tackle Rob Kraeling. Sophomore Brittain Brown, who led the ground game with four carries for 16 yards, returns to replace lost starter Shaun Wilson, but Jackson adds another weapon. The 6-foot, 215-pounder dropped 15 pounds from last year when he arrived from Atlanta Pace Academy. The defensive most improved players were sophomore cornerback Myles Hudzick, junior linebacker Koby Quansah and sophomore safety Marquis Waters. Following the scrimmage, Cutcliffe said he was most pleased with the aggressiveness of the defense. He cited the windy conditions limiting the passing game, but mostly he praised the defense.